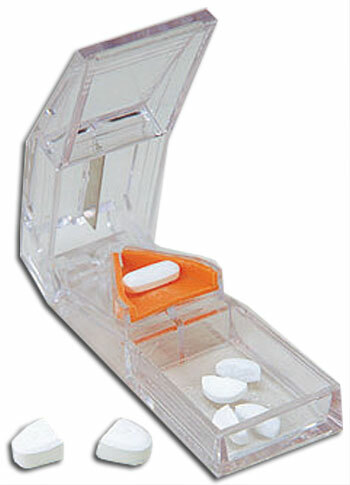 Promotional Pill Splitters -Cutters Personalized in Bulk. Great Precision, Clear or Translucent. Budget Prices for USA, Canada. Our deluxe wholesale Pill Splitters with new see-thru design is the first product to address the more precise cutting demands that larger, non-standard sized pills present! We also supply blank (not custom imprinted) bulk pill splitters -pill cutters: see the Price Table. What makes this product unique is its V-shaped cutting holder, made of a soft plastic material that holds and ensures greater cutting accuracy. Budget Prices in USA and CAnada for high quality pill cutters. Free artwork design. We will send you a proof for your approval before production. Prices below are for blank (not custom imprinted) pill splitters or they include your 1-color custom imprint. Add the amount shown for extra imprint colors. Setup Charge: $40.00 per imprint color; No Setup Charge on repeat orders. Production Time: 7-10 days after art approval; contact us for faster delivery. Blank pill cutters ship next day. Check also our even more economical personalized pill splitters -cutters. Size: 1-5/16" x 3-14" x 1"
Imprint Area: 15/16" x 1-1/16"